Everyone wants to own their own dream home. It can be a secluded cabin in the woods that somehow has great Wi-Fi or a huge studio apartment overlooking Central Park. So your goals may not be that extravagant, but you should know if you can afford a home before you even consider speaking with the realtor. 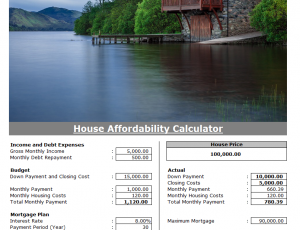 The Home Affordability Calculator takes relevant information, such as your gross monthly income and other factors and gives you a calculated total for a house that’s well within your price range. The template makes everything quick and easy for you to enter your information and receive your results instantly. The only thing you need to do is enter your gross monthly income and monthly debt repayment amount. Scrolling down, you’ll also enter your down payment and monthly mortgage bill, interest rate, pay period, and various other pieces of relevant information for your home loan that is required by the Affordability Calculator. With that information entered into the Home Affordability document, it will display the amount for a house that is within your price range. If you’re in a rush, there’s also a more simplified version of the template on the “Simple Calculator” tab. This tab only requires an interest rate, payment period and expected monthly payment, based on what you can afford, and gives you your affordable house price. Using this template will allow you to choose a home based on your income so you can live comfortably as you make your monthly payments. While you may not be able to buy a castle on the coast, choosing an affordable home is a step in the right direction and who knows, maybe you can sell your home one day for a down payment on that castle. Not what you were looking for? Search again! Your free template will download in 5 seconds. Check out this offer while you wait!